The astronomical table was made by Nicolaus Copernicus probably at the turn of 1516 and 1517. It enabled a graphical representation of the moment of the vernal equinox. The determination of this date allowed to determine the dates of movable church holidays and, above all, to conduct research on the reform of the calendar. This change was necessary, because the difference between the length of the calendar year introduced by the Council of Nicaea (325 AD) and the astronomical year resulted in regression of astronomical phenomena in relation to calendar dates. In the early 16th century, this difference amounted to 10 days, which was why Pope Leo X ordered the reform of the calendar, dealt with by the Fifth Council of the Lateran. On the table, Copernicus drew seventeen lines corresponding to the movement of sun rays at five-day intervals. Sixteen of them reflect the Sun's apparent movement through fragments of hyperboles, and one is a straight line. This straight line expresses the moment of the vernal equinox. It was additionally highlighted in blue and marked with an inscription, the remains of which – T, I, C – have survived to this day. It is believed that these letters are a relic of the word "Aeqinoctium" – equinox. The computational range of the table covers the days between January 25th and April 24th. Not only does the use of observation of sunlight projection reflected from an object located on the sill of the gallery's third window make the table a priceless Copernican relic, but also the oldest known example of the use of gnomonic reflection. 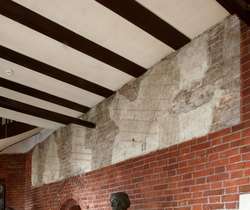 The visible plaster defects are the results of the castle's redevelopment which took place in 1676. This was when the gallery, and thus also the table, were divided with partition walls which were removed in the mid-nineteenth century. At the Museum of Warmia and Masuria operates an interdisciplinary team studying the Copernican table, attempting to describe it in a scientific manner and unravel its mysteries.